There's nothing small about the Chihuahua's personality: he is bold, brave, and endlessly charming. This Mexico native is tiny and demands constant attention from his people in both playtime and snuggles. He is alert, with a 'terrier-like' tenacity and confidence. Chihuahuas often become strongly attached to one person in a family and can be hyper-protective of their favorite two-legged friend. They have a reputation for dancing to the beat of their own drummer, but Chihuahuas are trainable and will follow the household rules with committed and patient training. Coat - Chihuahuas can have long or short coats that are soft and glossy. Their coats can be a wide range of solid or mixed colors, including chocolate, fawn, cream, black, blue, red, sable, and brindle. Chihuahuas are fast-moving little dogs, with a graceful stride and sassy demeanor. They have rounded little heads and a 'saucy' expression in their dark, round eyes. Chihuahuas have somewhat short, pointed muzzles and a lean face topped with large, erect ears. Their bodies are sleek and muscular, with either a short or long coat in a wide variety of colors. The Chihuahua evolved from ancient dogs known to be companions to the Mayans and the Toltecs. Remains similar to the Chihuahua have been found in the Mayan ruins of Chichen Itza in Mexico. The dog was likely taken to Europe for the first time by Spanish explorers and conquerors. Its modern name derived from the state of Chihuahua where American tourists first met the little dog. Chihuahuas are 'sassy,' brave dogs with an alert, confident demeanor. They are highly independent and like to do things their own way. They'll spend most of their time in the arms or lap of their favorite person if given the chance. Are Chihuahuas Good with Kids? Fragile Chihuahuas are not ideal pets for families with little kids who may play too roughly with the dog. They are good with older children who have learned to be gentle with pets. Are Chihuahuas Good with Other Pets? Chihuahuas are good with familiar cats, but are sometimes bellicose with other dogs. Socialize your Chihuahua at an early age to be comfortable and non-combative around other dogs. Chihuahuas are protective of their space and their owners. If allowed, they'll join the ranks of the 'Armpit Piranhas,' usually small dogs who snarl and bark in their owner's arms when anyone comes too close. Are Chihuahuas Good Guard Dogs? The alert Chihuahua is a good watchdog who will kick up a ruckus when people approach your home. Despite being fierce when needed, they are too little to protect anyone from danger. Chihuahuas are moderately energetic. Often they'll get much of their activity scuttling from room to room in the house. Training requires time and patience. Prone to shyness, the Chihuahua needs socialization at an early age so he knows how to interact agreeably with others. Don't leave your Chihuahua outside alone because he is in danger of becoming prey to birds, foxes, or coyotes. Indoor Chihuahuas are indoor lap dogs. They enjoy going outside to explore the backyard or go for a walk, but when they get back they would like to be in the house with you. Short and long-coated Chihuahuas get cold easily. They shouldn't be outside for long when it's cold, and benefit from wearing a dog jacket outside and a sweater indoors. They shed and will leave fur around the house, though not too much due to their small stature. Outdoor Chihuahuas enjoy a short walk outside, but they are not the outdoorsy type. After his quick walkabout in the back yard or down the block, your Chihuahua will be ready for more lap time indoors, or maybe an outing in the car. Exercise Chihuahuas need to exercise for about half an hour every day. They can usually get enough exercise to stay healthy with a few walks around the neighborhood, along with some short play sessions in the living room or yard. Endurance Though Chihuahuas possess the stamina for long walks and vigorous play sessions, give your Chihuahua breaks from his play sessions, because he will keep going if the games are fun. Running Miles: A healthy Chihuahua will trot by your side for a half a block, but his legs are too short to make him a good running partner. Hiking Miles: A Chihuahua will hike with you on the half-mile trail. You may feel like it's a short distance, but it's much further for a Chihuahua's short legs. Food Tiny Chihuahuas require only ¼ cup to ½ cup of quality dry dog food each day, split between two meals. The amount will vary depending upon the size, weight, and age of your dog. Talk with your veterinarian about an optimal diet plan. Alone Time Even though they are independent, Chihuahuas dislike spending time alone. They can spend an hour by themselves, but beyond that they are likely to become frustrated and may resort to destructive behaviors, such as chewing or barking, to pass the time. 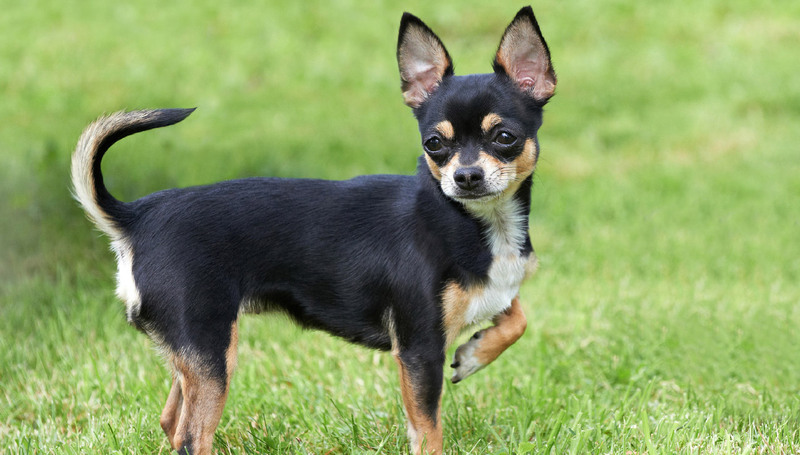 Short coat Chihuahuas should be brushed once a week, while the long-haired variety needs to be brushed more often to prevent tangles or matting. Give your Chihuahua a bath once or twice a month. Trim his nails every few weeks and gently clean his ears every week to prevent wax buildup, which can lead to infection. You can minimize serious health concerns in a Chihuahua by purchasing from a reputable breeder who engages in responsible breeding practices, and through screening for common diseases and conditions. Chihuahuas are independent and don't like being told what to do. However, consistent and patient training from an early age will yield a well-mannered little dog. Athletic and energetic, Chihuahuas take well to agility training, advanced obedience classes, and dog sports. Be sure not to overwork their little legs. For millennia, Chihuahuas hunted rats and today they'll charge after the occasional bird or squirrel. They are not used as hunting dogs, however, or put through the paces of field training. No. Chihuahuas shed and thus leave pet dander in your home. Dander is the cause of most pet-related allergies. Because Chihuahuas are small, however, you can manage their fur and dander more effectively than you can the hair and dander from a medium or large dog. Because of their small size, Chihuahuas sometimes possess a Napoleon complex, with a tendency to growl and nip at those bigger than themselves. But if you put yourself in a Chihuahua's tiny paws, it's easy to imagine why they can get a bit defensive. Chihuahuas are not naturally mean, they just need to be well-trained and socialized, and have their personal space respected. Chihuahuas often shiver because they're cold—many Chihuahuas will appreciate a sweater or dog coat if it's cool—inside or out. But anxiety or overexcitement can also cause shivering; if your Chihuahua shivers frequently, take him to the veterinarian for a checkup. Chihuahuas may be able to swim, but probably won't want to—at least not beyond a minute or two. Big bodies of water can be scary for this tiny breed, and they chill quickly.